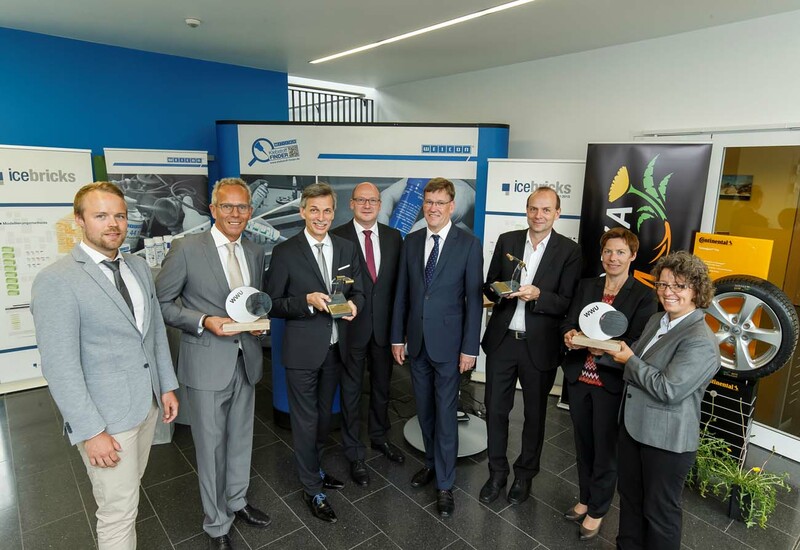 Technology company Continental and Prof. Dirk Prüfer from Münster have together received the University of Münster’s Transfer Prize for the Taraxagum research project. The aim of the research is to obtain natural rubber from the root of the Russian dandelion for numerous rubber applications. The prize was awarded for the successful transfer of expertise from biotechnology research to commercial application. With the aid of biotechnology developed in Münster, the scientists can optimize the time required to breed a productive and therefore industrially exploitable dandelion plant. The University of Münster’s Transfer Prize is endowed with €10,000. The prize money will be donated to the work of the University of Münster’s botanical gardens, which was where the first dandelion plants for research into dandelion rubber were bred. Continental plans to open its own Taraxagum research laboratory in Anklam, Mecklenburg-Western Pomerania, later this year. Locally sourced rubber will save on long transportation routes and consequently reduce carbon dioxide emissions. Continental expects the dandelion tire to be ready for series production in five years‘ time at the earliest. Dr. Carla Recker (right) received the Transfer Prize from the University of Münster on behalf of Continental. The Russian dandelion has an exciting property: Its latex contains high molecular weight rubber, that is to say long chains of rubber molecules which are an important raw material for many rubber products. Past attempts to utilize this raw material were unsuccessful but now all that has changed. Tire manufacturer Continental has used dandelion rubber to produce prototype tires for trucks and passenger cars and tests have shown that the tires are roadworthy in every respect. Continental is currently investing €35 million in a research laboratory for dandelion rubber in Mecklenburg-Western Pomerania, supported by the federal state’s Ministry of Economic Affairs. The fact that the dandelion rubber is now being rendered usable is all thanks to the research team headed by Prof. Dirk Prüfer. A biotechnologist, Prüfer is Professor of Plant Biotechnology at the University of Münster and head of the “Plant-based Biopolymers” department at the Münster branch of the Fraunhofer Institute for Molecular Biology and Applied Ecology. Initially, however, the scientists were engaged in fundamental research, with no thought of a specific application. “It isn’t our mandate to build tires,“ says Dirk Prüfer. “We’re out to understand the molecular basis of rubber biosynthesis in this plant.” Now, though, it is precisely this biological understanding that is bringing industrial use within reach. But while the Russian dandelion (Taraxacum koksaghyz) contains more rubber than other dandelion species, the amount produced is not yet sufficient for industrial scale production. And for all its robust and undemanding nature, the dandelion is not a crop plant that delivers the stable yields that would make it economically viable. Not until now, that is. Because targeted breeding programs are currently bringing about a change. One key aspect here is the development of DNA markers by the researchers in Münster. These markers are naturally occurring sites in the genome that are detectable in the laboratory and in each case occur in the genome in combination with the “stage directions” that produce a certain desired property of the plant. One example is a higher rubber content. Using a DNA analysis, the scientists can determine whether or not a seedling has the desired property, so they can tell the breeder immediately if it is worth continuing to breed with this plant. So this process, which in ancient crops took place intuitively and sometimes over millennia, can be specifically influenced and is already showing promising results after only a few plant generations. Parallel to the ongoing breeding program, the Continental research laboratory in Anklam, Mecklenburg-Western Pomerania is scheduled to go into operation later this year. Continental expects the dandelion tire to be ready for series production in five years‘ time at the earliest. Then, by using the locally obtained natural rubber, it will be possible to save on long transportation routes and cut carbon dioxide emissions.